*It should be noted that a lost Jam Handy Direct Mass Selling film entitled “Jumping Beans” is credited by some sources as a Nicky Nome Technicolor cartoon. After researching copyright logs, the author believes this film was a black & white documentary film with Technicolor sequences similar to “Seeing Green” (1937), “Color Harmony” (1938), and “The Hot Head” (1939). 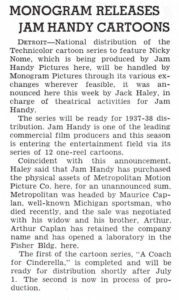 All of the cartoons, which fortunately still exist today (thanks to the hard work of Rick Prelinger), were originally released non-theatrically by the Jam Handy Organization and also theatrically by the Jam Handy Organization and Monogram Pictures. After watching all of the cartoons in order, the author believes the reason for their discontinuation deals with the decline in quality of each of their stories. While the second and third Nicky Nome cartoons are quite enjoyable, the final three seem to struggle and send the impression that their creators were clueless as to where to take the series. 1938 trade for A Coach For Cinderella. The film was well received by trade ads and the general public. It was also a film the Jam Handy Organization was very proud of and showed to potential clients. To understand why the Nicky Nome cartoons were produced, one has to revisit what the Direct Mass Selling program was. 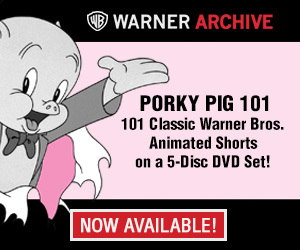 (To briefly restate my March 2017 article for Cartoon Research:) The program, which was responsible for around 120 theatrical shorts, was one of the most ambitious advertising film campaigns of the 1930s and possibly only one of it’s kind produced during the golden age of American moviemaking and animation. It was launched in March of 1935 by Jam Handy and Chevrolet for Chevrolet Dealers to attract interest in their products through the use of short films for public exhibition. All these topics were used to emphasize that Chevrolet was the safest, comfortable, best ventilated, scientifically engineered car on the market. The majority of the films were one reel in length and made use of popular short subject formats consisting of documentaries (which were the crown jewels of the series), narratives/comedies, novelty newsreels and animated cartoons. Frequently the films highlighted Chevrolet’s “Knee Action” (i.e. how springs in the wheels reduce the bumpiness of a ride), air ventilation to bring comfort for those traveling, streamline design allowing the vehicle to get the best economy, and the cars’ durable strength. 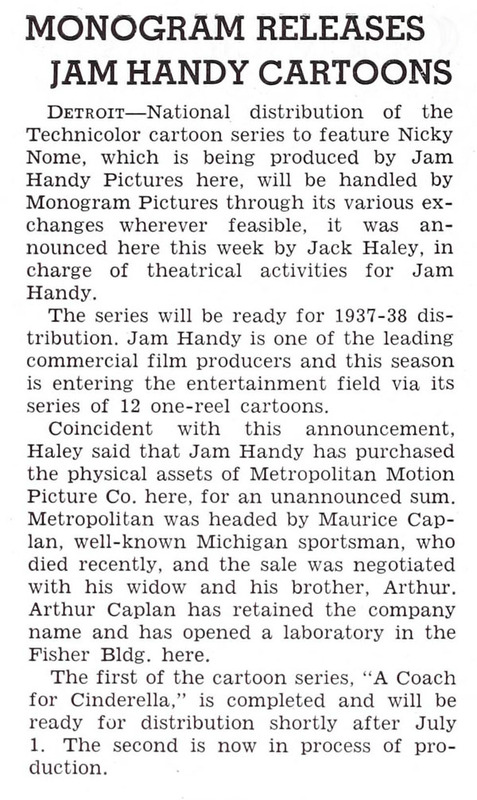 In the summer of 1936, about a year after Direct Mass Selling began, the Jam Handy Organization released the program’s first animated cartoon Down The Gasoline Trail and was a huge success. The excellent performance of this black & white educational cartoon led to an interest in having more Direct Mass Selling animated films and as history shows brought about it’s next production, A Coach For Cinderella. The film would be the first Technicolor film for the program and puts to use the popular Disney Silly Symphony format to educate audiences on how the assembly line benefits the film’s characters. Interestingly A Coach For Cinderella was made immediately following The Flint Sit Down Strike, and the cartoon along with the Jam Handy symphonic industrial film The Master Hands both appear to have been produced to address negative publicity toward Chevrolet from the UAW. 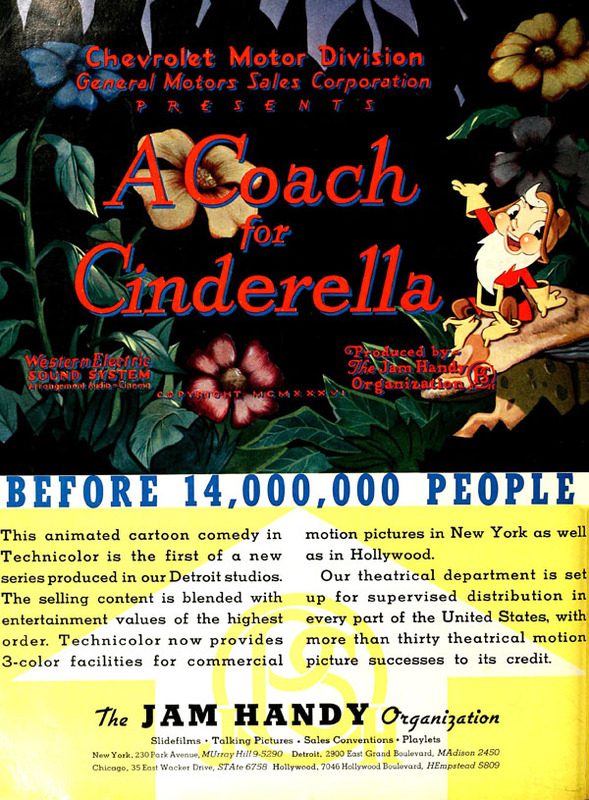 Along with combatting negative publicity, A Coach For Cinderella was also created to launch a series of Technicolor advertising cartoons with an animated cartoon star to promote the Chevrolet brand. Around this time period Technicolor cartoons, especially those produced by the Disney Studios, were some of the most popular short subjects to be exhibited at theaters; Mickey Mouse, who by 1937 was strictly appearing in Technicolor, was receiving more fan mail than any living movie star. 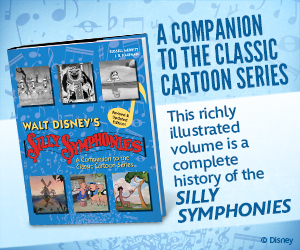 With the popularity of the Technicolor “Silly Symphony” cartoon format and characters such as Mickey Mouse, it’s easy to see why the Jam Handy Organization would pursue making a series of animated Technicolor cartoons for the Direct Mass Selling program. It was certainly not the intent of Nicky Nome to drive Mickey Mouse out of theaters, but instead tailgate off of the popular cartoon format with an animated character to entertain and educate viewers on the benefits of Chevrolet automobiles. A Coach For Cinderella does just this as it introduces Nicky Nome to audiences and shows off Chevrolet’s ‘spring knee action’ (around 5:30 minutes and then around 8 minutes), window ventilation (around 6:20), and perfectly aligned headlights (around 7:50). The positive reception of A Coach For Cinderella brought two more Nicky Nome cartoons: A Ride For Cinderella and One Bad Knight. While Samuel Benavie’s music scores are similar to his work in A Coach For Cinderella, the quality of their animation is far superior and almost looks like they were made by a completely different studio! Unfortunately an explanation for this is not currently available to the author. According to trade ads (which the author has not been able to see) both of these films, along with the following three Nicky Nome cartoons are credited to being directed by Frank Goldman. However the animation says otherwise as several of these films feature beautiful and humorous animation by Jim Tyer, who was working for the Jam Handy Organization around this time. (While Frank Goldman’s filmmaking is admirable and deserves more recognition, he unfortunately was not the best animator.) The scenes not animated by Tyer appear to be done by individuals not officially affiliated with Jam Handy. In terms of Frank Goldman directing, his involvement was probably limited to designing the characters, writing and storyboarding the films, with Jim Tyer directing the animation. It is possible that the films were made entirely at the Jam Handy Organization in Detroit, and the studio brought in animators to work on them. (The Van Beuren studio recently closed and some of these folks may have briefly ended up at Jam Handy). Another possibility is that the animation was outsourced to another studio such as TerryToons, Cartoon Films Ltd., or The Bray Studios where it was supervised on site by Jim Tyer. Until official documentation turns up, this will unfortunately remain a mystery. Mysteries aside, the second Technicolor cartoon to feature Nicky Nome was A Ride For Cinderella, released in 1937/1938. The cartoon is a sequel to it’s precursor and interestingly is one of the only one-reel animated sequels to another cartoon from this era. This enjoyable cartoon tells the story of Cinderella quickly driving her Chevrolet sudan through a nasty hurricane to get home before the struck of midnight. The hurricane is created by the old witch of the forest (who “is always in an ugly mood and loves to poison peoples food”) at the request of Cinderella’s miserable step sisters. Fortunately with the help of Nicky Nome and the Chevrolet ‘coach’, Cinderella is able to safely and comfortably travel back to her home prior to the arrival of midnight. The entire cartoon is an animated demonstration of the Chevrolet Sudan that shows off the durable strength of its steel body against evil spirits and bad weather, Chevrolet’s spring knee action that allows the coach to drive over trees knocked over by the witch’s storm, and open window ventilation that prevents rain and ice cubes from hitting Cinderella. (Unlike the miserable step sister’s old fashioned horse driven coach which is destroyed by the storm.) Overall the cartoon is an enjoyable product demonstration, that’s enhanced by Jim Tyer’s animation and also by Samuel Benavie’s music score, which makes use of Edvard Greig’s Hall of the Mountain King. While the dialog is campy, it has its moments thus adding to the fun. The third cartoon was One Bad Knight, released in 1937/1938 and is an interesting entry in the Nicky Nome series. It’s also the author’s favorite Nicky Nome cartoon to be made after A Coach For Cinderella. 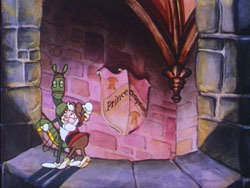 While the film is another medieval themed cartoon, it breaks away from the Cinderella story and transitions into the story format the Direct Mass Selling Technicolor cartoons would utilize: A young teenage boy and a girl encountering a villain, and having the day saved by Nicky Nome’s Chevrolet sudan. In the story of One Bad Knight a young princess is “stolen” by the Black Knight, and is rescued by the young boy with the help of Nicky Nome and a Chevrolet sudan; The car, which has the power of many horses and is a moving fortress, is able to comfortably demolish (in style) the Black Knight’s castle without getting a scratch! Overall it’s a fun cartoon that once again makes use of great animation and a terrific music score by Samuel Benavie. •	Peg Leg Pedro – Released in 1938 tries to tell the adventure of two children going up against a ship of pirates. •	Nicky Rides Again – Also released in 1938, is a very bizarre pilgrim and Native Americans tale where peace is brought to the land by Nicky Nome and his Chevrolet Sudan. The cartoon uses stereotypes of Native Americans which were used in similar themed cartoons made by other studios during the 1930s, such as Molly Moo Cow and The Indians (1935). •	The Princess And The Pauper – Released in mid-1939 is an Aladdin, Arabian Knights story that is narrated by Vincent Pelletier (which unfortunately could be described as annoying illustrated radio). Sadly, this is probably one of the worse films made for the Direct Mass Selling program during its 1935-1941/2 run. The Nicky Nome series abruptly ended following The Princess And the Pauper and while the reason as to why is not known to the author, it would not surprise him if it dealt with the last three cartoons underperforming with audiences and the crew responsible for the cartoons clueless as to where to take the series. Interestingly Nicky Nome’s screen career ended around the same time the Direct Mass Selling program made some extreme changes, as the two reel institutionals and the Novelty Newsreels (The Chevrolet Leader News series and Laughs And Flashes series) were discontinued. Instead the program focused on making one reel documentaries and comedies for the 1940 and 1941 seasons and the advertising nature of the films was made even more subliminal and quiet; the opening and closing credits do not even mention the name Chevrolet anywhere on them. 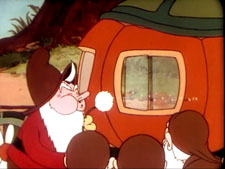 Instead of producing Nicky Nome type cartoons, the program re-issued cartoons such as A Coach For Cinderella, Down The Gasoline Trail (with different animation at the end) and produced new one reelers such as the clever 1941 comedy A Case of Spring Fever and the documentary Drawing Account. Drawing Account is an interesting Direct Mass Selling film as it demonstrates how a Chevrolet cartoon is produced and even features artwork from Peg Leg Pedro. However the films ending animation sequence (which was animated by Jim Tyer) does not use Nicky Nome and instead stars an army of imps running over a small army of demons with a Chevrolet. The Direct Mass Selling program ended in early 1942 with the arrival of World War II. Following the War, it was revamped as the Direct Selling Service which focused on documentary films similar to those produced for the Direct Mass Selling program. The only series that was produced for this program was a series of three minute live-action Technicolor travelogues called “Roads To Romance”, which used the Coach For Cinderella Theme as their opening music. 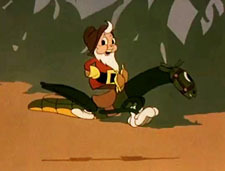 Once in a while an animated educational cartoon (such as 1957’s Turboglide) would be produced for the program, however a cartoon series like Nicky Nome was apparently never attempted again. 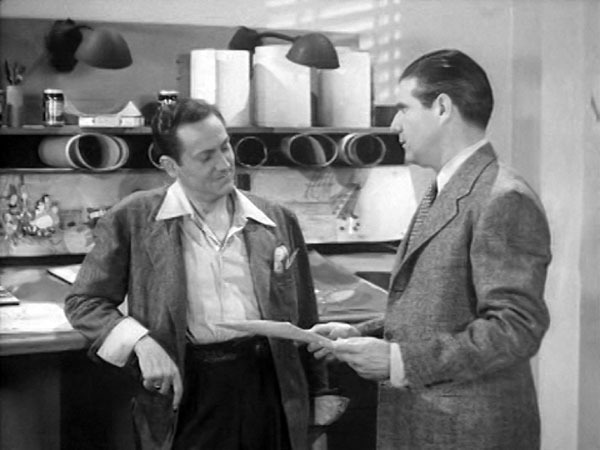 A Still from “Drawing Account”. Note the artwork in the back from “Peg Leg Pedro”. A Special Thank you this week to Rick Prelinger, Ray Pointer, Jerry Beck, and Brian Oakes. I listed “Peg Leg Pedro”as one of the top 10 greatest advertising cartoons. I didn’t know you thought the cartoon is one of the more weaker cartoons! Even for youtube quality I was blown away by the colors for these Nicky Nome cartoons at the time. Some cartoons I saw on youtube were awfully faded and these stood out from other pd cartoons. I wonder if Thunderbean can top Rick Prelinger’s. Nicky Nome’s clever ways of using the Chevy, running over pirates and taking the ship full of gold pulled by a Chevy from the sea (Peg Leg Pedro), not getting a scratch from driving the Chevy (One Bad Knight) and of course, praying to the Gnome Gods that Cinderella will be okay (A Ride From Cinderella). I mean, General Motors should have adopted Nicky Nome as a full-blown mascot retiring in the 70s! It’d almost be like the Joe Camel contreversy, selling an adult product using a cartoon character! Genius! It always struck me odd that Nicky dropped off the face of the earth after Princess And The Pauper. I’m sure there is more to the story as to why. (“Drawing Account” doesn’t even have him.). In terms of Peg-Leg Pedro, I will say it is probably the better of three final cartoons; my issue of the film deals with how it’s basically a clone of “One Bad Knight” (my favorite aside from “A Coach For Cinderella”) only the humor is just not as witty. But I do agree with you about the use of color especially in “A Ride For Cinderella”, One Bad Knight, and “Nicky Rides Again”! Very colorful cartoons! I take back what I said about Nicky Nome being the mascot. Dr. Seuss and Charles Schulz used their characters to sell cars as well. Gil Turner does some of the animation on “A Ride for Cinderella” and Tom Baron and Marty Taras were also at Jam Handy around this time peroid.